The best way to find Atlanta area handicap accessible bathroom and kitchen remodeling companies that meet these criteria, is to contact remodelers and ask the following questions. The answers to these questions will provide much of the information you need to locate a home remodeler for Atlanta, Lawrencev ille and Gwinnett disability or handicap accessibility home renovations. Does the home remodeler have a permanent address and have they been doing business for a long time, under their current name? Do they have experience doing the type of work you are interested in having done, such as stair lift installation, door widening, ramp installation or walk-in tub and roll-in shower installation? Does the remodeler have all of the necessary insurance to conduct business? Contact Atlanta Home Modifications to set up a free on-site visit at your home to discuss flooring, lighting, electrical HVAC and lighting control solutions, stair lift installation, door widening, ramp installation or walk-in tub and roll-in shower installation for your home. 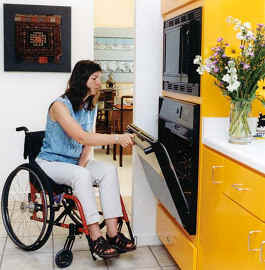 We are an Atlanta based disability and handicap accessibility home renovation company. Contact us by calling 770.880.3405 or visit our Atlanta Home Modifications website.